It is day 21 of #30daysofgratitude a Snapchallenge that I am hosting on my Snapchat channel (username blissbkery). I love seeing what everyone is grateful for each day. 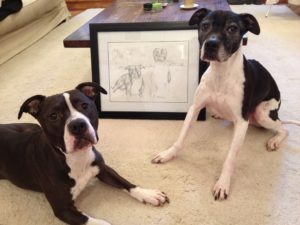 It is nice that I am not the only one giving “props” to the four legged lovable creatures in our lives whom we call pets. In fact I’ve already given thanks this month for Stella our sweet pit! 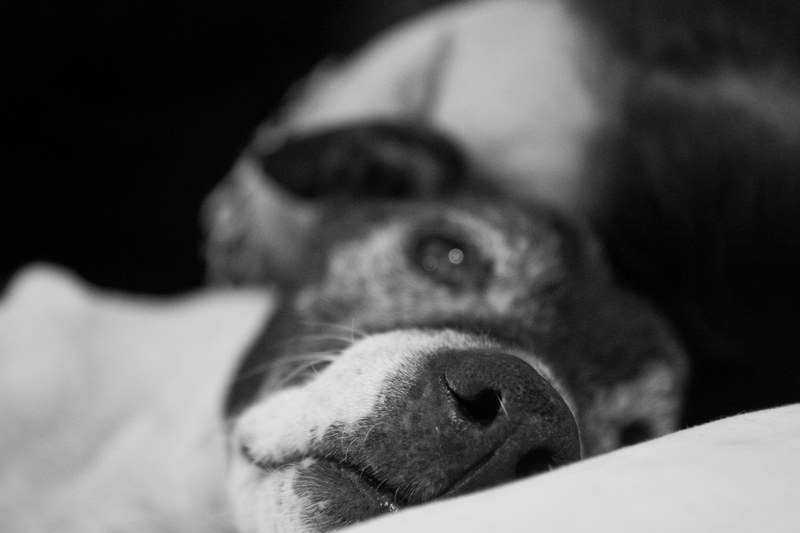 But today I have to pay homage to Jack, our Soul Dog, who passed away two years ago today after blessing us with fourteen years life. Portrait painted by Caren Ginsberg (real life mommy to Jack who was the namesake for my Jack). In February I traveled from L.A. to London with him like this! I wrote a post about him last year on his one year anniversary. It was very emotional, but it resonated with many dog owners who grieve the loss of “man’s best friend”. I am going to re-post it here now. Why? Because to be honest, I still feel exactly the same way. It was an honor to have been Jack’s family and not a day has gone by since he passed that I haven’t thought of him! Some of you might not have read it if we’ve only just met. 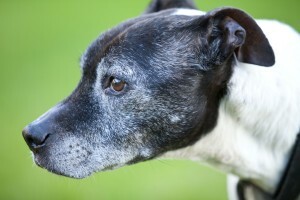 Some of you who have read it wouldn’t mind reading again as you are recent pet owners. To the later, I am sure you are aware, your hearts have now been transformed! How do you say goodbye to your best friend? How do you let go of someone that literally saved your life? How do you grapple with the inevitable finality of a family member’s time on earth? Well, even a year after our beloved Jack passed from this life, I still don’t have the answers. All I keep saying is, we were blessed with the best soul dog there ever was! 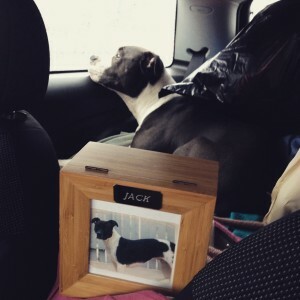 Sure Jack was a four legged canine with a tail and fur and all the other bits and pieces that dogs come equipped with, but he wasn’t just a dog. He was so much more. Clearly he wasn’t human, but I don’t know what else to call him but a soul dog. Of course all dog owners (the good ones anyway) are going to say, “oh my dog is special, he is the best, he is more than just a dog, etc”. But I don’t consider myself a dog owner. 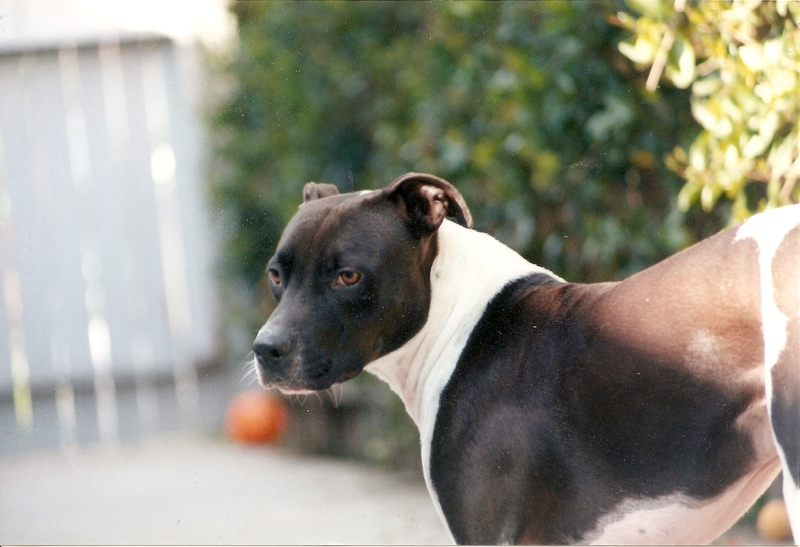 I was simply the caretaker for 14 glorious years to a soul, an old man soul, who happened to inhabit the body of a black and white pit bull terrier mix! The thing about Jack is I didn’t want him. We had dogs over the years, the regular ordinary kind of dogs. I was always the one to shoulder the burden of the care and expense. When my ex and I got divorced I knew I couldn’t do that anymore. A single mom of two kids working full-time and going to college in the evenings it wouldn’t have been fair on a dog anyway. My kids would beg for us to get another dog and I always refused. So my son got clever. He didn’t ask, he just resorted to the old tug at the heart strings approach. He called and asked for a ride home from a friend’s house. He mentioned his friend’s mom had rescued a little puppy at the park and they couldn’t keep him. When I arrived to pick up my son, he came out and through my car door window placed Jack in my lap. He was a sweet little thing at the time, and he said, “Mom, can we just look after him until we find him a home?”. Once Jack hit my lap his DNA became embedded in my heart. We never found him a home, because we didn’t need to. He stayed with us and graced us with his presence. No matter who it was that met him or interacted with him, they too became enraptured by his beauty and his personality. Whether the vet, the groomer, the doggy daycare helper or the boarding facility he went to when we were on vacation. 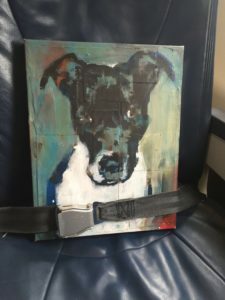 They all gave Jack “the special treatment”, forgoing the protocol for proper dogs, because Jack was special and that is what he deserved. He was regal and his beautiful brown eyes would just pierce your soul when he looked at you. In his prime, he was a stud. Very imposing and muscular. But he was such a softie and wouldn’t hurt a fly. In fact he was even friends with a cat (named Cous Cous) that would walk the neighborhood on a leash with its owners. Clearly that cat wasn’t a standard cat either. Jack wasn’t without fault. The guy had the most deadly gaseous emissions. Like, so bad it was toxic. I think I might still have a tinge of black lung in fact. He was also sneaky. He would do naughty things behind our backs but then act like an angel, or pretend he was bored and yawn when we confronted him about it. Once we decided to see if we could catch him in the act of jumping on our bed when we were away from the house. My Hubby set up a camera and indeed we got it all on this video. But then we were like, how could we be mad at someone who just wanted to feel near to us when we were away? It was just that this was his clever way to stay close to us, on our bed under our covers. Not too hard, not too soft, but just right. A sort of Goldilocks syndrome. For the record, he had his own beds, complete with blankies and all. But if he really wanted to be on our bed that much while we were out of the house, well then I suppose he deserved it. Jack was a bit lazy and liked to sleep in and also to cuddle. In fact, his were the best cuddles you would ever have. They were therapeutic in fact. Researchers recently came out with a study confirming the fact that petting and touching dogs helps to boost our oxytocin levels (feel good hormones). I could have announced that statistic to the world! 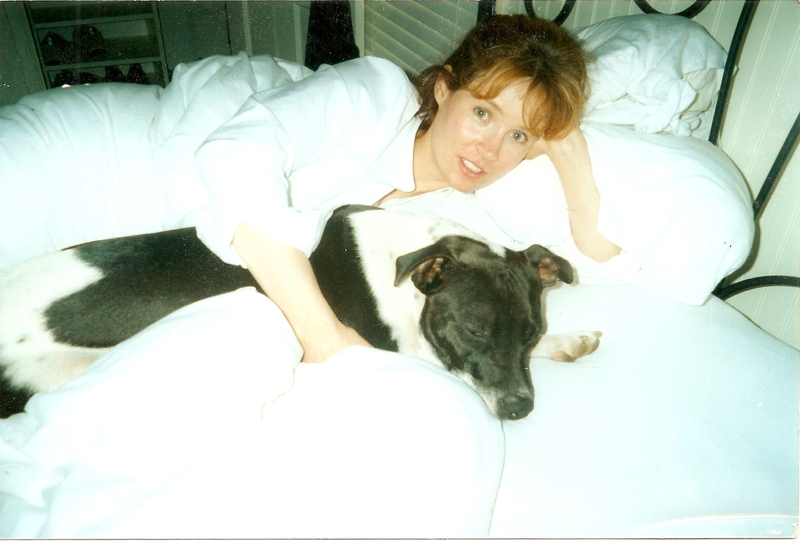 When I became an empty nester at 36 years old I needed some oxytocin big time. My daughter left for university and my son left to attend boarding school across the country at the same time. There I was, feeling so sad and lonely missing my kids. But Jack just looked at me everyday with those eyes. As if to say, “Hey what about me, I’m still here, I’ll give ‘its da cuds’ to make you feel better” and that is just what happened. Our long walks, our drives in the car, our visits to the dog park, they all helped me get through the difficult times. He was there! And even if he could be bossy (like when you stopped petting him cuz your hand was about to fall off and he would nudge you with his head to make you keep on going) you knew that he had your back. He was loyal and protective. In his younger years, when he had his teeth, he liked to chew. He would go through toys like nobody’s business. I should have taken stock in Pet Smart! But he also liked a taste for a bit of wood. Or a lot of wood. He ate the wooden threshold on my back door, he ate the wooden fence across my driveway, and he literally ate an entire set of wooden steps in my back yard. Luckily my Hubby replaced those with brick! So that wouldn’t happen again! But the worst was when he ate through the wooden window blinds in my house. You know those really pretty (and expensive) plantation shutters? Yea, well to top it off, he ate only a bit of each set. I wished he had just eaten all the slats of one whole set. But no, each and every window had just a little bit chewed off. He was so sensitive that if you did get mad at him he would pout for days. I couldn’t take the mood of the house being so ill affected! In fact, during “Shutter Gate” when he knew I was mad at him, I would just have to point at the blinds and he would slink off to another room. And I missed him when he did that. So I made sure to keep the pointy finger tucked away. We have this thing in our family which we call “dee-dees” and it is like being tickled. Jack would come over and stand there and wait to be dee-deed on his leg or tummy. He would go into this trance like state where his eyes would be semi closed and you just knew he was happy to have chosen us as his guardians. When Jack was five years old we decided to get him a companion. Stella (also a black and white pit mix) moved in and though he acted like she was a bother, we knew he kinda liked her. She, now 10 years old, is a bootylicious doggie and all that flesh makes her good and warm to cuddle. Together they made the big move with us to Ireland. I think getting out of L.A. gave him a few extra years and bit of pep in his step. Even though they were both fixed, there was the “mojo” going on with her. For some reason, being in the car made him even more frisky. We would drive around Dublin and people knew it was us. Not because our silver Mini Cooper was so recognizable in itself. But because it would be bouncing up and down as we cruised through town. Stella loved him so much. He just put up with her. He would go from room to room in the house to get away from her but she would always follow him. He had 5 years as an only child, she never knew life without him. As much as I have grieved Jack’s passing, she probably misses him even more. She used to sit on his head, why I never figured out. Maybe to keep him from going into another room? But now there is no one to sit on and she is lost. I don’t have the heart to get another dog. Jack can never be replaced. So now we dote on Stella even more, and we do adore her so much. But here is the thing, she is a dog. A sweet dog, but a dog. We didn’t take Stella with us. Jack deserved our undivided attention. The last drive to the vet was dreadful as my Hubby held Jack in his arms. Usually very stiff, he was so weak and floppy. Before his last breath I kissed him on the lips and said, “I love you now and forever”. 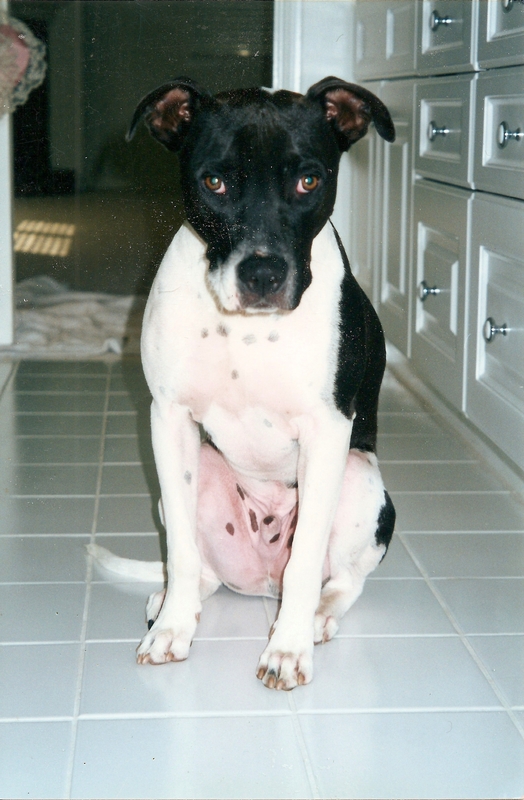 Sobbing away, my tears which Jack used to lick from my face, now fell on the veterinarian’s sterile tile floor. He was at peace. And though his physical body gave out his spirit lives on. There hasn’t been a day in the last 365 that I haven’t thought of him. How many get to have the privilege of spending 14 years with someone that has had that much of an impact on their lives? People say, 14 is a long life, as it’s 98 in dog years. But what is it in soul dog years? It’s infinity! Because he will eternally live in our hearts!